County Laois is located in the south of the Midlands Region and was formerly known as Queen’s County. It was shirred in 1556 by Queen Mary as Queen’s County, covering the counties on the southwest side of the River Barrow also. Laois received its present Irish language name following the Irish War of Independence. Portlaoise (previously Maryborough) is the county town. 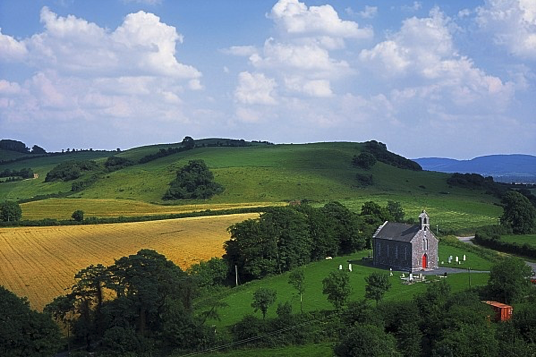 Laois was the subject of two Plantations by a mix of Scottish and English settlers. The first occurred in 1556, when Thomas Radclyffe, dispossessed the O’Moore clan and attempted to replace them with settlers. However, this only led to a war in the county and left a small Scottish and English community clustered around garrisons. There was a more successful plantation in the county in the 17th century, which expanded the existing Scottish and English settlement with more landowners and tenants from both Scotland and England. Neither plantation was fully successful due to a lack of tenants and because of continuous raids and attacks by the O’Moores.